Peschici San Menaio Gargano holidays on line sea art city travel Puglia hotels bed breakfast residence villas self-catering accommodation in Apulia. is a pleasant village locayed in the municipality of Vico del Gargano in northern Apulia that it lies between orange-orchads and pine-wood-parks boastings a pretty sandy beach, a beautiful and trasparent sea set amid a luxuriant Mediterranean vegetation lush. The village has become nowdays an important touristic resort, a well-known seaside centert in the Peninsula of Gargano. Nature in San Menaio has remained uncontaminated and the fresh fragrance of the flowers and of the plants joins with the intense perfume of the Adriatic sea. Hotel and Villa Nettuno at San Menaio are a charming holiday complex set directly by the sea, between Rodi and Peschici in the beautiful Gargano region, amid seculars pine-wood-parks. The Hotel Pineta is set in the Gargano National Park, close to the wonderful beach of the Apulian sea. It is ideal for holidays in this delightful land. The Suite Le Dune is a five-star hotel in Peschici, near San Menaio, well situated for visiting the Park of Gargano. The beachfront rooms are equipped with mini bar, wi-fi and air conditioning. The Dune Suite Botel provides the restaurant, a fitness centre, a swimming pool and a tennis court. Guests can have access to the private beach. The Centro Vacanze Incontro Hotel is a three-star resort in Peschici, not too far from San Menaio. The hotel boasts rooms facing the sea, a private beach and free car parking. The rooms of the Centro Vacanze Meetings are air conditioned. Take advantage of the restaurant, specializing in local dishes. The hotel is a perfect destination for summer holidays! The Piccolo Paradiso is a 3-star hotel in Peschici that has a wide private beach, as well as rooms looking out over the sea. The hotel rooms offer a safe and TV. The Piccolo Paradiso Hotel provides an excellent restaurant, free car parking and free wi-fi. Water sports or hiking in the National Park of Gargano should not be missed. The Gusmay Resort Hotel is a four-star hotel in Peschici, not far from San Menaio and near the private beach. By choosing this hotel the guests can have access to the spa and enjoy the pool, in addition to the restaurant that serves local dishes. The rooms are equipped with satellite TV and air conditioning in summer. 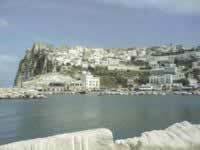 The property is close to the harbour of ferries for the Tremiti Islands. Find the ideal hotel for your holiday in the seaside resort of Peschici -San Menaio! Check our special seaside offers for Peschici -San Menaio: choose your hotel with a sea view for your next summer holidays by checking the hotel and accomodation list in our guide. Treat yourself to one of Peschici -San Menaio's hotels with a private beach, a few steps from the sea or choose to stay in a hotel in Peschici -San Menaio with a swimming pool by the sea. Use our guide to book one of the hotels in Peschici -San Menaio which provide rooms with a view of the sea. Look on the map for hotels close to the sea and the beach in Peschici -San Menaio. If you have decided to travel to Peschici -San Menaio by car or motorbike, don't worry about finding a parking space or leaving your vehicle unattended. Display the list of hotels and accomodation in Peschici -San Menaio provided with a parking place or a garage. Book a hotel in Peschici -San Menaio with a parking area! Don't leave your dog at home. Use our guide to check the list of hotels and accomodation that welcome dogs in Peschici -San Menaio. It is also possible, from our selected list of hotels and accomodation where animals are allowed in Peschici -San Menaio, to keep your dog in the room with you! Check our offers of hotels and accomodation in Peschici -San Menaio with rooms equipped for the disabled! For your stay in Peschici -San Menaio, book a hotel accessible to disabled people. Choose your hotel in Peschici -San Menaio from the list of hotels equipped to welcome disabled people! Wi-Fi hotels in Peschici -San Menaio ? Are you looking for a hotel or accomodation with a quick internet access and wi.fi? Click on the list of hotels in Peschici -San Menaio which have a wireless connection to internet and wi.fi. Look for gay friendly hotels or gay friendly accomodation in Peschici -San Menaio, choose to sleep in a gay friendly hotel or gay friendly accomodation in Peschici -San Menaio! Take advantage of our offers of gay friendly hotels or gay friendly accomodation to book your holidays in Peschici -San Menaio.